Satpura National Park is a National park of India with an area of around 524 square kilometers situated at Satpura Mountain Ranges in Hoshangabad district of Madhya Pradesh state. Satpura Hills at Satpura National Park. Photo Source : Creative commons Licensed under CC BY-SA 3.0. 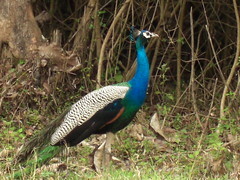 This National Park is different from other wildlife parks of India in offering various wildlife watch options. 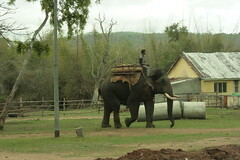 Boat safari, Elephant safari, Jeep safari, Walking safari, etc, are some among these options. Along with the nearby Pachmarhi Bori Sanctuary, Satpura National Park; is one among the national parks in India; covers an area of 1427 square kilometers and forms Satpura Tiger reserve. This National Park is rich in Flora and Fauna. There are around 1300 plant species inside the National park. Fauna includes Black buck (unique to this area), Indian Giant squirrel (specialty of this park), Indian Bison(Gaur), Leopards, Tigers, Wild boar, Wild dog, Spotted Dear, Sloth bear, Sambhar, Four-Horned Antelopes, Smooth Otter, Porcupine, Pangolin, Marsh crocodiles, Languars, etc. How Do I Go to Satpura National Park? Jabalpur – Hoshangabad road connects the Satpura Wildlife National Park of India with the nearby cities. Sohagpur (SGP) is the nearest railway station at 18 kilometers distance on the Howrah-Mumbai Railway line. Other nearby railway stations on the same railway line includes Pipariya (PPI) at 40 kilometers, Hoshangabad (HBD) at 45 kilometers and Itarsi Junction (ET) at 65 kilometers distance. The nearest airport to Satpura Wild Life National Park is at Bhopal with IATA code BHO; at around 200 kilometers distance from the Wild Life Park. Another nearby airport, Jabalpur Airport with IATA code JLR, is at around 260 kilometers distance from this world famous Wild-Life Park. Which is the ideal time to visit Satpura National Park? The Park is closed from 01st July to 16th October, every year. You may visit the National Park from 17th October to 30th June. Is accommodation available at Satpura National Park? Forsyth Lodge is one of the best resorts at Bijakhori village. Denwa Backwater Escape Resort is a 12 room, countryside living style themed wildlife cottages, on the banks of Denwa river, spread over an area of around 10 acres, near to Madhai village. There are other resorts also in and around the Satpura National Park.